Alpine is a gem. A remote, high-desert jewel nestled in the tall hills of West Texas. It is a friendly, bustling community of a little over 5,000 people in a scenic valley that feels like nowhere else in the state. You’ll immediately take note of the natural beauty surrounding the city, if you don’t notice the great weather first. Rated by Texas Highways readers as one of their favorite destinations in the state, this is the perfect spot for you if you’re ready to get away from it all, but not ready to do without some familiar amenities. There are plenty of wonderful accommodations, from historic hotels to cozy guest rental homes, that make this the perfect staging ground for any visit to the area. For starters, you might like to review Texas Monthly’s list of Top 10 Things To Do in Alpine. If you’d like to step ahead to something specific, please click the links above, visit us on facebook for up to the minute event details, or call the Alpine Visitors Center for more information at 1-432-837-2326. For a preview of things to see and do, keep reading on. Sul Ross—the University of the Big Bend—sits on the western slope of Hancock Hill, overlooking the Alpine valley. Along with irreplaceable contributions to the intellectual and cultural life of the region, Sul Ross boasts one of the most beautiful campuses in the state, or anywhere else for that matter. Founded in 1917 as a teacher’s college, SRSU now offers undergraduate and graduate programs in a wide variety of disciplines, and is considered the birthplace of collegiate rodeo. The Museum of the Big Bend is located on the campus of Sul Ross State University. This is a great starting off point for anyone coming to the region for the first time. Highlighting the vast geographical and historical record of the Big Bend region and the communities in it, the museum is a great way to not only get more knowledge but also be inspired to explore more of the sights and activities in and around Alpine. Two of those sights and activities are at Kokernot Field. The field, built in 1947, and funded by Herbert L. Kokernot Jr., is still considered by many to be one of the most beautiful ballparks in the country, if not the world. Detailed ironworks, open-air seating and scenic backdrop imbue this stunning red granite structure with a great charm. Kokernot Field is also home to the Alpine Cowboys, a semipro team in the Pecos League. Catch The Cowboys as they take the field through late spring and summer for a small-town baseball showdown. The field is adjacent to Kokernot Park, the city’s largest. In addition to a pool, tennis courts and acres of trails and fields, the park is located near the Alpine Country Club and its 9-hole golf course. The park is also home to the Theatre of the Big Bend, where outdoor performances by Sul Ross’s theater program brighten up the stage during summer. A peaceful walk in the park is a relaxing way to spend your time in Alpine, but a casual stroll through downtown along historic avenues and architecture will reveal plenty of enticing shopping, from inviting boutiques to interesting bookstores and art galleries. 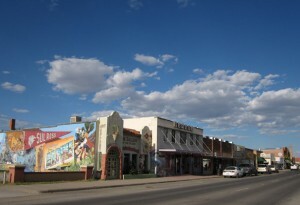 Most of downtown Alpine was named a Designated Cultural Art District in 2011 by the Texas Commission on the Arts! Walking around Alpine is a fantastic way to soak in the local color, and also work up an appetite. Fortunately, there are quite a few options throughout the area for visitors. You might stumble across a flavorful food truck for lunch or make reservations for more fanciful fare at one of our finer dining establishments. Being at the center of everything in West Texas makes it convenient to bounce around from one locale to another. Catch the rolling hills and mountains of the southbound road to gorgeous Big Bend National Park. the sweeping plains west to art-mecca Marfa, the frontier brush to charming Marathon, and the peaks and twists of the Davis Mountains to quaint Fort Davis. Day trips will take you to the breathtaking Big Bend National Park, with its stunning vistas and incredible sites. Or the rugged Big Bend Ranch State Park, with spectacular backcountry hiking trails. Close by, the Chihuahuan Desert Nature Center provides scaled-down hikes showcasing the variety of flora and fauna in the regional desert terrain. If wilderness isn’t exactly what you have in mind for a day out, there’re also the famous astronomical telescopes of the McDonald Observatory and plenty more within range. If you decide to stay in, keep your eyes and ears open for events. This is a lively community, home to rodeos and theatrical productions, a weekly farmer’s market, a bounty of live music, and prominent events such as the Texas Cowboy Poetry Gathering and Trappings of Texas, Viva Big Bend music and food festivals, and Alpine’s ARTWALK, among others. Try our events calendar, and for up-to-the-minute information, have a look at our Facebook page. Well, whether you decide to take in all the activities and sights available in the area, or pick a nice hill where to relax and read a book, we trust that you’ll enjoy the laid-back atmosphere and attitude that makes Alpine a very special, spirited place. We hope this web site serves as a good starting off point for your West Texas adventure, providing information you can use to plan an unforgettable trip. If you desire more information or have any questions, please don’t hesitate to call the Alpine Visitors Center at 1-432-837-2326. Other excellent online resources can be found at the Alpine Chamber of Commerce and Visit Big Bend.